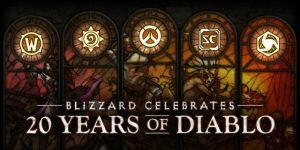 Since this December 31st will mark the 20th anniversary of Blizzard’s iconic action-RPG: Diablo, Blizzard will celebrate this big day with in-game events and other cool stuff not only in Diablo 3, but also in Heroes of the Storm, Hearthstone, Overwatch, StarCraft 2, and World of Warcraft. Here is the list of what’s to come according to the announcement. While this seems like not much, Blizzard has mentioned that more will be announced and that there is something in development.